From Aquatics to Zumba, our pros are here to help you excel in your sport – and in your life. Enjoy the benefits of healthy competition at our clubs. 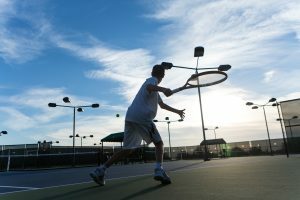 We offer a multitude of individual and group sports including tennis, basketball, master swim and racquetball. Kids swim lessons, swim teams, master swim and more. Dominate the court with the help of our basketball pros. Sink the putt on golf courses across the country. Learn from the pros and burn calories with the Secret Sport. Work on your strategy while getting a great cardio workout. Perfect your backhand on our state-of-the-art tennis courts. Swim, bike and run your way to the finish line with The Village.